Yamaha recently launched the all new version of its popular naked bike, the FZ. Yamaha has priced the FZ V3 FI ABS at Rs. 95,000 (ex-showroom) while the FZ-S V3 FI ABS has been priced at Rs. 97,000 (ex-showroom). The new bike has been given a host of styling changes that make it look smarter. Now, the company has released their latest TVC which shows the bike in action for the first time. Take a look at the video below and enjoy the new look of the bike. As seen in the video, the bike has been beefed up quite a bit and looks a lot fresher. It gets a new, more muscular tank, LED headlamps, ABS among other features. The TVC focuses on the new look as well as the ride-ability of the bike. The FZ has always been a sweet handler and the same has been shown in the video too. In the naked 150 cc segment, the Yamaha FZ is one of the most popular bikes rivaling the likes of Suzuki Gixxer and Bajaj Pulsar among others. As per the new safety guidelines issued by the government, the FZ is equipped with ABS. However, it is a single channel system unlike double channel which some other bikes offer in the segment. Though a double channel unit increases the cost of a bike, it definitely is much better than a single channel unit. Another interesting aesthetic addition made on the bike are the side vents mounted on the tank. They actually look quite good and increase the aesthetic appeal of the bike. Talking of changes, the bike also gets a new engine cover along with a new set of alloy wheels that further hint towards this being a newer generation bike. The saddle is a single piece units that extends towards the tail of the bike. The exhaust muffler and short tail section are again inspired by the FZ25. Also, the bike now sports a digital instrument cluster which will display an array of information along with the regular stuff. Yamaha has not made any changes to the engine and it continues to be the same old unit. The FZ V3 is powered by a 149 cc, fuel-injected motor that churns out 13 Bhp of power along with 12.8 Nm of peak torque. The engine is mated to a 5-speed transmission and comes with disc brakes at both the front and the rear. 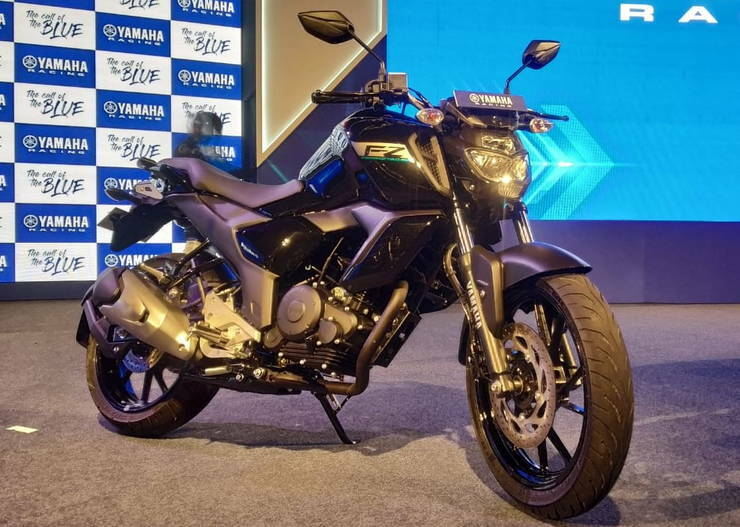 There are a total of three colour options available on the FZ-S (Black-grey, Blue-grey and Cyan-grey) while the FZ gets two colour options ( solid black and solid blue). With the new V3 of the FZ, Yamaha has again made a solid entry in the highly competitive 150 cc bike. How the new bike will fare in terms of public response will be seen in the coming months. « The Mahindra XUV300 is coming to a mall near you!